This tour runs on Sundays and Wednesdays at 10:00 a.m. and Fridays at 11:00 a.m.
Children as young as 3 years old are welcome to join the tour. The boat holds 30 people. The pickup and dropoff time depends on your hotel address. Please enter your accommodation address in the booking form, and we will contact you about the exact times. If you or anyone in your group has a food allergy or constraint, please let us know. Participants should bring a swimsuit, towel, change of clothes, and sunscreen. No prior experience is necessary, but participants should be able to swim confidently if snorkelling. 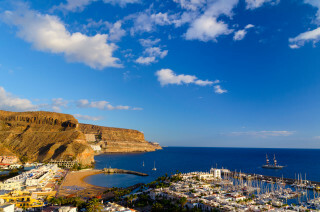 Gran Canaria may be a popular traveler’s destination, but there’s one area on the island you’ll be sure not to see any people. The protected southwestern coast of Gran Canaria remains quiet, preserved, and mostly empty. Cruise along the water on a 3-hour boat tour to admire the jagged mountains and secluded beaches of this peaceful area. 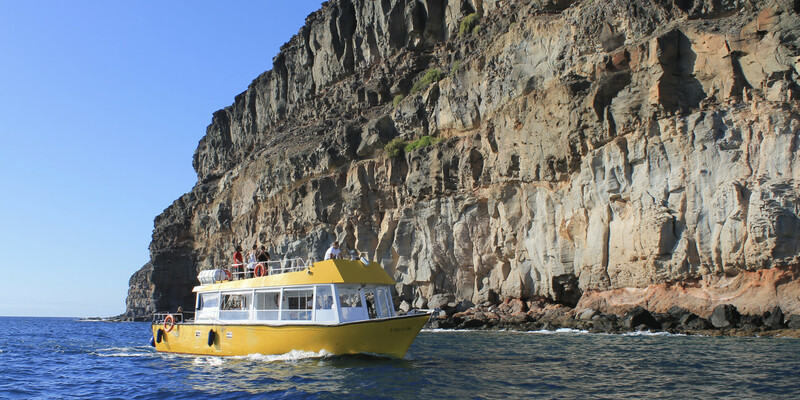 With hotel pickup and dropoff, you take a shuttle to Puerto de Mogan on the southwestern coast of Gran Canaria. Here you have some free time to wander around the port and quiet fishing village before boarding the boat. Tour guides are available in English and Spanish, but if you have a request for another language just let us know. 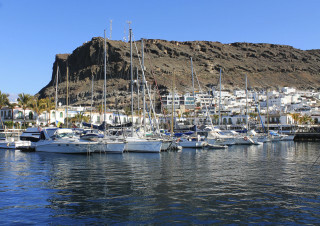 Set off from Puerto de Mogan up north along the coast and admire high hills of steep rock faces. Secluded beaches peak through the coastline, like Playa Tasartes and Playa los Secos, with gray and orange pebbled surfaces. As you enjoy the views and the sea breeze, your guide provides a background of the island’s diverse nature and history. 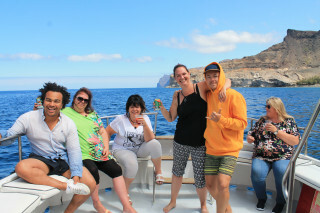 Beverages and homemade Spanish tapas are complimentary on the boat, so you can munch and sip your way through the tour. To fully enjoy the homemade tapas, pair it with fruity homemade sangria. After cruising for an hour, the boat stops at a bay so you can leap into that shimmering water. Borrow snorkel equipment from the boat and observe the colorful wild environment below the surface. Gran Canaria’s unique mix of Caribbean, Mediterranean, and Atlantic species create an outstanding display of wildlife. 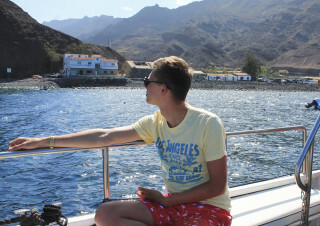 After you’ve snorkeled, swam, or napped in an inflatable tube, climb aboard the boat for the one-hour journey back to Puerto de Mogan. After a bit more time to see the area, the shuttle brings you back to your accommodation. Spend time out on the bright blue oceans of Gran Canaria, observe untouched nature, and taste the local cuisine. Who knew exploration could be so relaxing?